Thomas Kienbauer told the newspaper Kronen Zeitung that that he was so dissatisfied with the policies of the ruling coalition that he felt he should make a bold statement. “Sometimes, you have to present an exaggerated view of the situation if you really want to make a point,” he added as he explained why he chose to express his political standpoint in such an extreme form. Not everyone seems to be happy with his statement. His sugary creation has created uproar among Austrians, who haven’t hesitated to post critical comments online. Many people described his 9/11 cake as “awful,” “unbelievable” and “offending”. @Heute_at ihr habt ja wirklich irgendeine psychische erkrankung. alle zusammen. unglaublich. However, Kienbauer says it was not his intention to offend anyone. What he wanted to do, according to the Kroner Zeiting, was to encourage people to reflect upon the current political situation in Austria. 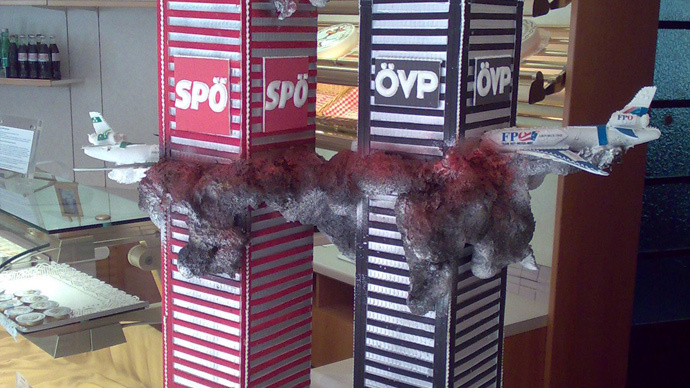 Just as the horrific 9/11 attacks changed the world, he created his confectionary sculpture in the hope that change would come with the end of the current ruling coalition.